Yesterday, firm CEO Chamath Palihapitiya basically confirmed our reporting — via both a Medium post and interview with The Information — while simultaneously calling it "fake news." Pretty neat trick. What he announced: Social Capital will no longer take outside capital, and even more staffers are expected to depart. By year-end, it will become a "technology holding company" that invests off of its "balance sheet," with investments of between $50 million and $250 million. Palihapitiya is basically turning Social Capital into a family office. LP sources say there are still fund reserves for follow-on investments, the funds might recycle some profits, and any additional needs could be offered to LPs as direct investments on a no fee/no carry basis. Conference call: This was a regularly-scheduled LP advisory committee meeting, and it only lasted around 30 minutes. "He kept dodging questions," one LP on the call says. "There would be a question about things like organizational structure — who is actually managing our investments? — and he wouldn't give direct answers." There does not appear to be any LP appetite for firing the general partner. Or at least not yet. 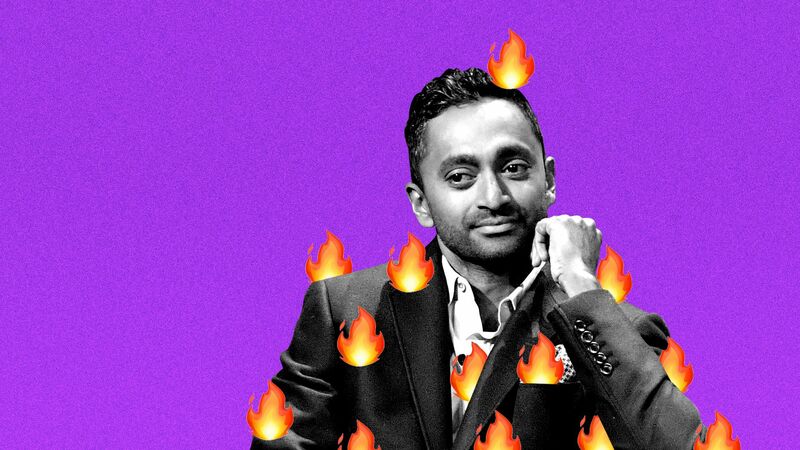 One big reason, as voiced by an investor, is that spearheading such an effort could get his firm blackballed by Palihapitiya's influential Silicon Valley friends. Too much risk for too little reward. Social Capital has not responded to any of my requests for comment for the past three weeks (including yesterday). Same goes for direct inquiries to Palihapitiya. • Listen up: Yesterday I had Mike Allen on the podcast, discussing how last year's tax cuts have become a liability for Republicans in the midterms. One big reason is that many companies have focused more on share buybacks than wage increases. Listen here. • Airbnb sent a comment letter to the SEC, asking it to allow the home-sharing company to give equity to its hosts. Kia has the scoop. 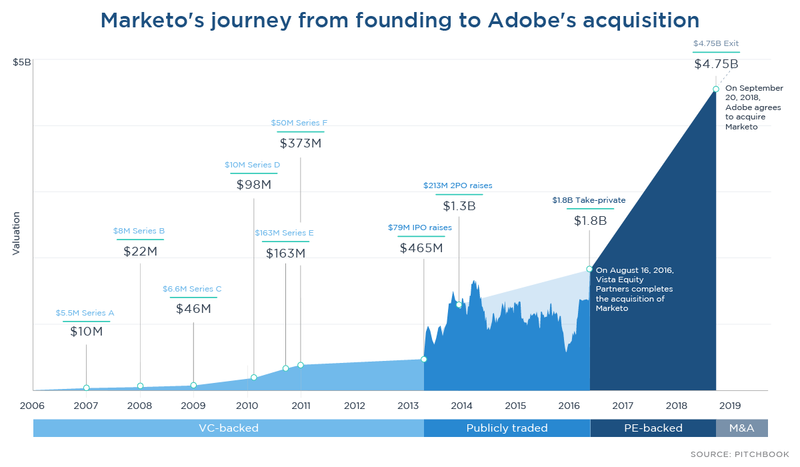 Adobe (Nasdaq: ADBE) agreed to buy Marketo, a San Mateo, Calif.-based maker of marketing automation software, from Vista Equity Partners for $4.75 billion. Why it's the BFD: This makes Adobe a more viable rival to Oracle and Salesforce, setting the stage for future consolidation. ROI: Vista raised eyebrows by paying a 64% premium to take Marketo private in 2016, but the total deal value was only $1.8 billion. • Bank7, an Oklahoma City-based bank with seven branches, raised $65 million in its IPO. The company priced 2.4 million shares at $19 ($18-$21 range), and will trade on the Nasdaq (BSVN). 🚑 Y-mAbs Therapeutics, a New York-based developer of pediatric cancer antibodies, raised $96 million in its IPO. The company priced 6 million shares at $16 (above range), and will trade on the Nasdaq (YMAB). Shareholders include WG Biotech (18.42% pre-IPO stake), Memorial Sloan Kettering Cancer Center (10.11%) and HBM Healthcare Investments (9.14%). • Tikehau Capital (Paris: TKO) said it’s in talks to acquire fellow French real estate asset manager Sofidy. • Bruce Andrews joined SoftBank as VP of global public policy, based in Washington DC. He previously was a managing director of Rock Creek Global Advisors and former Deputy Secretary of the US Commerce Department. • Jaime Lewis stepped down as a director in KPMG's VC practice to join Runway Growth Capital as a managing director and head of Northeast origination.